It is forbidden to pick flowers or plants inside the gardens. 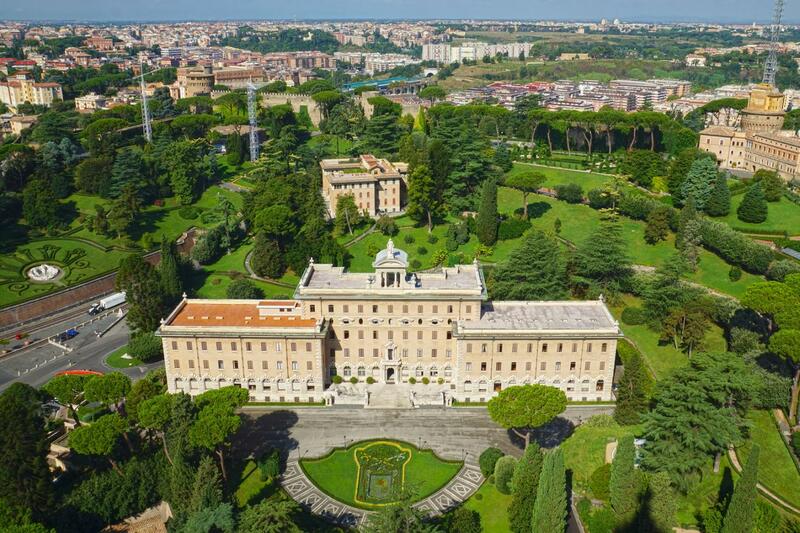 In case of an unexpected closing of the Gardens by the Vatican Security, the tour will be affected, following the itinerary of the regular tour. Please make your way to the departure point 20 minutes prior to the tour start time: Caffè Vaticano located in viale Vaticano 100, opposite from the Vatican Museum entrance. Late arrivals will not be accommodated. Escape the hustle and bustle of Rome and enjoy a stroll through the peaceful Vatican Gardens, an oasis of tranquility in the heart of the Vatican City, decorated with idyllic fountains, sculptures and springs where very few people ever venture.Then access the Vatican Museums to see one of the most beautiful art collections in the world. No trip to Rome is complete without a visit to the Vatican Museums. Home to fifty-four different galleries including four statue museums: Museo Pio-Clementino, Museo Chiaramonti, Museo Gregoriano Etrusco and the Museo Gregoriano Egiziano. These museums are home to some of the most famous works of art in the world, with artists including Leonardo Da Vinci, Michelangelo, Caravaggio, Raphael and Giotto, to name a few. An experience that is sure to inspire the art lover in anyone. Our exclusivity is the inclusion of the 1505 Bramante Staircase, a section of the Museums now closed to the general public. People can only visit it in occasion of special openings for considerable sums of money, but thanks to our partnership with the Vatican we are able to let our customers enjoy this mind-bogglingly fascinating structure for free. The Bramante Staircase boasts granite Doric columns and a herringbone pattern on the floor, and was designed to allow people and animals to go up and down without interruption, but, above all, to permit Pope Julius II to enter his private rooms without getting off his carriage, being the ascension of the several flights impossible in heavy papal vestments. In this corner of the Museums you will live special moments of ecstasy admiring quaint views and listening to your guide as they tell you about this unique architecture which inspired numerous copycats. The 54th gallery of the Vatican Museums is the famed Sistine Chapel. Completed around 1483, the Sistine Chapel is arguably the most famous chapel in the world due to the artwork located within. View many of the most famous frescoes in the world, including the famous ceiling and The Last Judgement painted by Michelangelo. Not only does the Sistine Chapel hold some of the world's most precious works of art, it is still used for religious purposes such as the Papal conclave - the process through which a new Pope is chosen. Last but not least, St. Peter's Basilica - a popular pilgrimage site - is also one of the largest in the world and a shining example of Renaissance architecture. You won't ever forget having partaken in this value for money guided visit in Rome.